The Southern Weather Blend was blended and roasted for you by Onyx Coffee Lab. The Southern Weather Blend features coffees from Colombia and Guatemala. 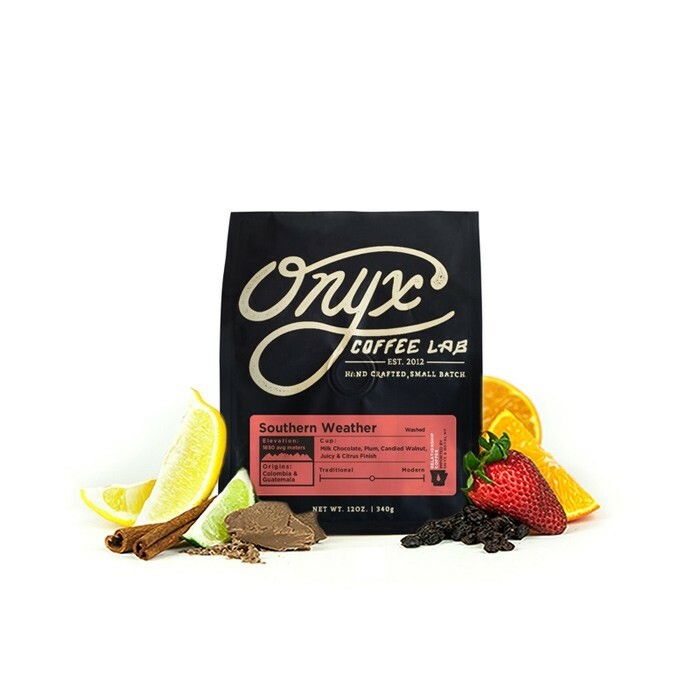 This combination of coffees create a profile that is familiar yet complex and sophisticated with notes of milk chocolate, plum, candied walnuts, and a juicy citrus acidity. A little darker than I am used to but I can appreciate the flavor. Such a yummy cup. Rich chocolatey flavors, and a juicy finish. Love it! It tasted bitter in a cold brew for the first few cups. Subsequent cups were better. Once I got this dialed in, its been great. Good with chocolate notes more than fruitiness. Real solid, juicy & deep. Really great coffee. Love how light and flavorful it is. Fruity and smells great. No bitterness. When I first opened the bag I was not impressed, the beans seemed dry and the aroma was not impressive...but once I ground the beans and used my french press, fantastic cup of coffee! The citrus and chocolate is perfectly balanced with the baking spices. Perfect cup to start the day! Brown sugar and fruit. Delicious! One of our go-to coffees. We love what Onyx does! Excellent flavors. Could use a bit more complexity. This is a great blend. Smooth and slightly sweet. Lots of flavor. Chocolaty sweetness, grapefruit finish, a nice breakfast blend. Perfect flavor for palette. Could drink a whole pot! It's a good cup of coffee! The citrus notes and the chocolate notes stick out. It has a good mouthfeel and is very forgiving. My brewing device that I used was a chemex. I did 27grams of coffee to 400 grams of water. I think I need to play with the ratio a bit to get a better cup. This coffee is amazing, I love everything about it.. I could drink this every day, I will order it again and again! One of the best! Nice even flavor, but not mind-blowing as expected from all of the hype. This is straight up the best coffee I've ever brewed in my press. Yummy warm chocolate notes with a slight citrus finish. Amazing. we really like this coffee. it was rich, complex and balanced. Great blend and subtle but enjoyable flavor profile! One of my favorite coffees to date. Every cup was incredible and I was sad when the bag was empty. This coffee is good but a bit citrusy for my own personal taste. I was hoping some of the other flavor notes would balance the citrus but it was definitely the standout flavor note. I brewed with a chemex, so I may possibly try a different brew method and grind size to see if the flavor develops differently next time. Review edit: I picked up an Aeropress maker before I finished this bag. Big taste difference. I do believe this coffee had some lemonade notes, but in a good way once I had it through the Aeropress. This is such a great coffee, might have been one of the few acidic coffees that I have no problems drinking at any time of the day off all methods of brewing. I liked this in a chemex at higher ratios, but unless I got it just right, ended up a bit sour and somewhat heavy for me. The fruit flavors were there, but a bit covered up by the chocolate. Smooth cup. Full bodied but not overly bitter. Upfront hints of chocolate with nice very subtle fruity finish. Solid good coffee but just OK.
Cocoa with a light juiciness and some citrus. Tasted good but nothing really stood out for me. This is my favorite coffee ever. Solid coffee. Nothing that stood out. I really wish that I would've tried cold brewing it. I feel like it might have been better suited to drink that way. Just OK, didn't possess any strong flavor notes. Made me question if I'm brewing properly. I use the chemex & encore. While this was good, it was much better for me as cold brew, and not as a drip brew coffee. I think I just prefer the richness of dark beans more. It may have been a tad too citrusy for my taste. I much preferred my first bag of coffee to this! Fantastic coffee! I made it as an espresso and really enjoyed it. One of the bst coffees I have received. Super smooth with a ton of subtle flavors. Get a smooth chocolate flavor and ends with a nice, fruity acidity. Everything I like in a coffee. Really well balanced blend as an espresso. Followed Onxy Lab's recommendation of 1:2.1 ratio at 25 sec. Sweet and nutty up front with a nice clean citrus finish.